Home News Special Projects The COSASE probe of BoU: How events unfolded and what way forward? The COSASE probe of BoU: How events unfolded and what way forward? The ground can no longer hold for BoU officials. 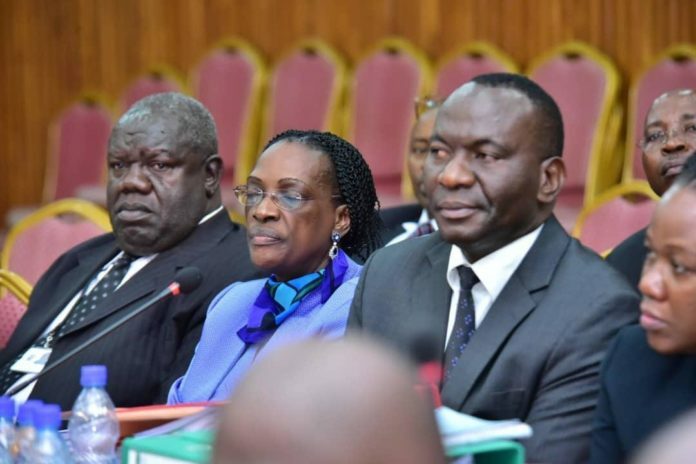 Parliament’s Committee on Commissions, Statutory Authorities and State Enterprises (COSASE) started investigating Bank of Uganda (BoU) after the Auditor General John Muwanga on August 27, 2018, presented to the Speaker of Parliament Rebecca Kadaga a special auditor report on seven defunct banks. The report had faulted BoU on legal, ethical as well as professional grounds, somehow confirming what the former owners of the closed banks were saying. Those grounds formed the basis for MPs to investigate BoU, the process which is still on going as the committee plans an exit meeting with BoU senior staff on Friday this week. The MPs also considered the complaints of some of the BoU employees who in March, 2018 petitioned the House, accusing the Central Bank’s senior managers of misconduct, tribalism, favouritism and fraud. This after BoU, Governor Emmanuel Tumusiime-Mutebile, carried major changes in the senior staff whereby he dropped former executive director of bank supervision Justine Bagyenda who later report her boss to IGG, Irene Mulyagonja, whose intervention resulted into a public spat between her and Tumusiime-Mutebile and was only cooled by President Yoweri Museveni. Also in 2017, businessman Amos Nzeyi, one of the shareholders of the National Bank of Commerce (NBC) dragged BoU to Commercial Court for wrongfully closing his bank (NBC) in 2012. Nzeyi alleged that NBC’s financial health had stabilised by the time BoU closed it and wanted court to hold BoU for alleged failure of supervising the banking sector. At the same time BoU was involved in a dispute with Sudhir Ruparelia, the majority shareholder of Crane Bank Limited after the central bank closed it on October 20, 2016. Before its closure, for a number of years BoU had lauded CBL as one of the best performing banks in the country. Its closure surprised many including President Museveni who argued against its closure but BoU officials could not listen. All the above situations presented an opportunity for a probe that would find the dirt in BoU which was claiming independence as well as wanting to take advantage of subjudice rule to avert the probe by the Auditor General. Muwanga’s probe of BoU started mid May 2018, after being given a green light by the Speaker of Parliament, Rebecca Kadaga. Kadaga on May 10 wrote to Muwanga, informing him to proceed with the investigations saying that BoU being a public institution could not dodge an investigation. In that My 10, 2018 letter to the AG, Ms Kadaga quashed the protests by BOU officials led by deputy governor Dr. Louis Kasekende who had resisted the investigation and was backed by legal opinions from an official of the office of the Solicitor General who had asked BoU officials not to cooperate with Muwanga and his team of auditors. “Therefore in response to your request for guidance, you should proceed with the audit as directed and submit your report to my office as it is required by the law,” the Speaker wrote. In a letter dated November 28 2077, COSASE; had requested the Auditor General to undertake a special audit on the closure of commercial banks by Bank of Uganda. The committee specifically requested the Auditor General to provide assurance on; the status of the banks at closure, cost of liquidation, status of assets and liabilities of the aforementioned banks from closure to date, non-performing assets, non-recoverable assets and liquidators. One of the findings in Mr. Muwanga’s report was the absence of documented guidelines for identification of purchasers of banks. “I observed that there were no documented guidelines/regulation or policies in place for the identification of the purchasers of the 3 defunct banks- Global Trust Bank Uganda (GTBU), National Bank of Commerce (NBC) and Crane Bank Limited (CBL) closed using the purchase and assumption arrangement. There were also no guidelines to determine the procedures to be adopted by the Central Bank in the sale/transfer of assets and liabilities of the defunct banks to the identified purchaser. In the absence of guidelines, I could not establish the basis used to select the purchaser and determining the values of assets and liabilities transferred by BOU to the purchaser,” he said. The Auditor General also accused BoU of failing to provide him with crucial documents related to the sale of banks, including quarterly liquidation reports, inventory reports and minutes of meetings. The MPs have been pinning BoU senior officials on various as presented findings in the report. However, during the inquiry to much dirt has been unearthed. On November 1, 2018 COSASE Chairman Abdu Katuntu sent back Tumusiime-Mutebile and Kasekende because they did not carry critical documents about the closure of seven commercial banks under inquiry. The MPs on the Committee on Commissions, Statutory Authorities and State Enterprises (Cosase) wanted BoU to provide inventory reports, loan schedules, customer deposit schedules, statement of affairs and reports on assets and liabilities. The documents explain why the commercial banks were closed and have other details about the status of the banks before the closure. On November 23, MPs on COSASE went wild when committee chairman showed them a letter indicating Bagyenda had flown out the country in the middle of the probe where she was a key witness. Katuntu, told members that he received a letter that morning informing him Bagyenda had flown abroad to attend to some engagements, which she confirmed long before the probe started. Bagyenda was supposed to clarify whether or not quarterly progressive reports on the liquidation of assets of closed banks were filed and their whereabouts as raised in the 2017 forensic audit report in which the Auditor General pointed out irregularities in the sale of commercial banks since 1993. Katuntu would warn her on his intentions to issue a warrant of arrest which forced her to return days later. On November 28, 2018 Four BoU security officers were put on oath by Cosase which is probing the central bank’s top officials and others over the irregular closure of seven commercial banks in the country. The four officials including a bodyguard of Ms Justine Bagyenda, the former executive director of supervision at BoU, gave more details of how Bagyenda was able to move documents out of the Bank without being checked as captured by CCTV Cameras. However, Bagyenda’s aide Juliet caused drama in parliament, saying standing orders of the police do not permit her to appear before a committee or any other related organ. She was over ruled by Committee Chairman Abdu Katuntu who said standing orders of the police force are subject to the Constitution of the Republic of Uganda. She would later take the oath. COSASE also in November arrested and later in early December remanded BoU security officer-Charles Omoro and Beatrice Kyambadde, who were on duty when Bagyenda moved out documents. The duo were charged with negligence of duty and were said to have lied when taking oath about the movements of the items in question. COSASE probe established that Bagyenda sold National Bank of Commerce (NBC) and Global Trust Bank Uganda (GTB U) on phone. According to Ben Sekabira, the director financial markets development coordination at BoU, NBC was facing a shortage of capital and battling a shareholder dispute which made it a risk. Sekabira, however, added that the potential buyer of the bank was identified via phone calls between the former executive director Justine Bagyenda, legal counsel Margaret Kaggwa, lawyers from Max Advocates and former Crane bank managing director A. R. Kalani. Sekabira said GTBU was also sold in the same way, which surprised Mps. The former owners of International Credit Bank faulted while appearing before COSASE faulted BoU for selling their bank within six hours after its closure. Former owners of Global Trust Bank Uganda revealed their bank was sold in one day in the process spearheaded by Bagyenda. The same happened with NBC whose buyers said they were forced by Bagyenda to buy it. In December, BoU Governor, Emmanuel Tumusiime-Mutebile denied ever delegating his powers to Bagyenda to enter into an agreement with DFCU Bank for the sale of Global Trust Bank. Asked by COSASE Chairman MP Katuntu if he delegated his constitutional powers to allow Bagyenda to commit the Central Bank into a Non-Disclosure Agreement with Dfcu, the Governor denied doing so. However, Mutebile letter present documents he signed for sale of GTB, something that the MPs castigated, saying he had at first lied to them about the GTBU sale saga. Bank of Uganda officials surprised when it came to light that it spent sh478 billion for running CBL a couple of months during the takeover before selling it to DFCU whereas Crane bank needed Sh157billion capitalization to remain afloat, as revealed by Ben Sekabira. BoU sold CBL to DFCU Bank at Shs200 billion interest-free but has failed to account for Shs478 billion. Former owners of all the banks that were closed that were closed now want BoU to compensate them for loss of business. For instance Nigerian owners of GTBU want over Shs310 billion, Greenland (Shs295 billion. Former owners of NBC say they are in discussion to establish the amount of money to be compensated by BoU. CBL owners also want an independent audit at the cost of BoU. All these demands mean a Ugandan taxpayer stands to lose hundreds of billions shillings due to bad practices of BoU senior officials implicated in the sale of the banks. This is not withstanding the fact that already the taxpayers have lost about Shs478.8 billion not accounted for by BoU yet it claims it spent it as liquidity support and other costs to CBL takeover. So based on the above, what is the way forward for BoU? What will happen after the probe? will BoU compensate the owners of these banks or it will be another what elephant.